SEATTLE, WASHINGTON, UNITED STATES, September 12, 2018 /EINPresswire.com/ — The Internet of Things (IoT) encompasses consumer, enterprise, and industrial market segments. Each of these markets has very unique needs in terms of infrastructure, devices, systems, and processes. One thing they all have in common is that they each produce massive amounts of data, most of which is of the unstructured variety, requiring Big Data technologies for management. Advanced analytics provide the ability to make raw data meaningful and useful as information for decision-making purposes. Mind Commerce believes that as much as 45% of enterprise value created through Artificial Intelligence (AI) will be as a result of AI support of Big Data Analytics and IoT platforms. The use of AI for decision making in IoT and data analytics will be crucial for efficient and effective decision making, especially in the area of streaming data and real-time analytics associated with Edge Computing networks. Real-time data will be a key value proposition for all use cases, segments, and solutions. The ability to capture streaming data, determine valuable attributes, and make decisions in real-time will add an entirely new dimension to service logic. In many cases, the data itself, and actionable information will be the service. 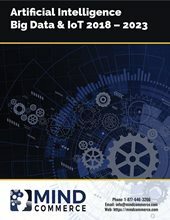 This AI in Big Data and IoT Market report (Artificial Intelligence in Big Data Analytics and IoT: Market for Data Capture, Information and Decision Support Services 2018 – 2023) evaluates various AI technologies and their use relative to analytics solutions within the rapidly growing enterprise and industrial data arena. The report assesses emerging business models, leading companies, and solutions. The report also analyzes how different forms of AI may be best used for problem solving. The report also evaluates the market for AI in IoT networks and systems. The report provides forecasting for unit growth and revenue for both analytics and IoT from 2018 – 2023. Mind Commerce is an information services company that provides research and strategic analysis focused on the Information and Communications Technology (ICT) industry. Our ICT reports provide key trends, projections, and in-depth analysis for infrastructure, platforms, devices, applications, services, emerging business models and opportunities.